Tonight is the larger of my two cross dresser - transgender- LGBTQ support groups. I added the extra "Q" because lately, we have seen several more questioning individuals. At the least, they add quite a bit more interest to the groups. Of interest, in the group tonight is the person who is a fetish cross dresser. He finally has cleared divorce proceedings and is deciding his sexuality may not be as specific as he once thought. Which is completely fine with me. He is the one who always proudly proclaimed he had to be a cross dresser because he is only into women. Now it seems, he "could" be into a guy if he was forced to cross dress in front of him. Again, nothing so rare about any of that. What I think is slightly humorous is he thinks he is so ugly as a man, or woman. He finally is posting some pictures and in them he looks quite a bit like Divine out of drag. If he comes tonight, I am thinking of bringing it up to him. At the least I can try to tell him to take the "drag queen effect" away from Divine and zero in on the fact they have basically the same rounded facial features. At the least, it should be interesting and I will let you know how it goes. 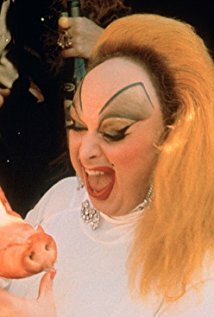 What the hell is Divine looking at in that pic? Is it appropriate for a family-friendly blog? I'd probably have that same expression on my face if offered one of those. My expression would not have to be painted on, however. Pickled pigs feet were a holiday tradition with my Appalachian grandmother!